Initially briefed to provide a lightweight planter box for the clients' elevated concept, H2O took the brief further and tasked ourselves with the creation of a complete package. We aimed for a lightweight planter box system that incorporated custom built fixings and drainage and irrigation provisions to suit the site requirements. Development of these planter boxes focused on the integration of a structurally safe internal fixing system that could be easily installed when elevated mid air without altering the overall look of the planters. Additionally a custom drainage/irrigation system was developed to work in conjunction with the landscape designer’s specs. Planter boxes and steel works were designed on Cad software and ordered accordingly. Once materials for the LICOM76™ planter boxes arrived they were assembled, fabricated to the Cad drawings and finished in a decorative rust. In the meantime all the custom steel work was manufactured by our steel supplier. Elevated in the air by a boom lift our installers positioned and attached the steel frames to the totem poles. The frames were then sleeved by the lightweight planter boxes and locked in position to allow for drainage and irrigation systems to be safely fitted off. 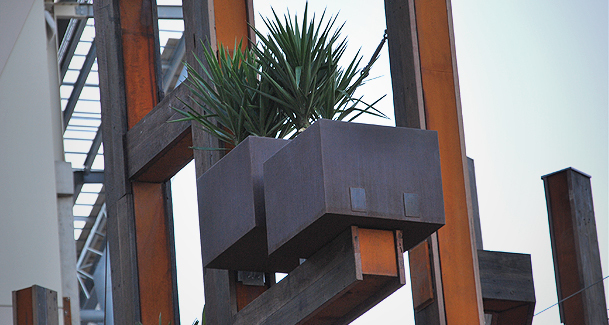 The Top Ryde Shopping Center planter box system takes a unique approach to vertical planting. 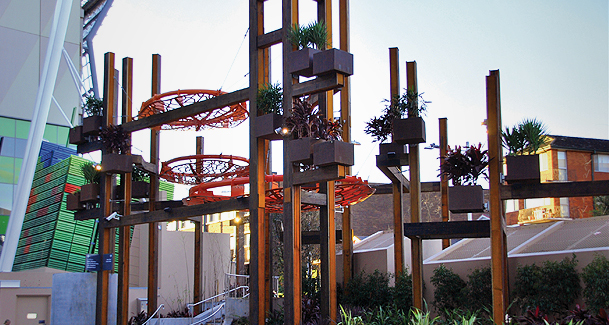 The lightweight planter boxes are suspended mid-air, held in position by internal galvanized frames fixed to the totem poles. The planter boxes have been designed with individual drainage and irrigation systems and finished in a specialty corten finish. The four different styled LICOM76™ planter boxes range in sizes from 400mm wide KUBE Series to a 1200mm diameter bowl planter.